I haven’t done a Friday Fun post in a really long time. These last two weeks have been rough. Discussions about library closings and the weather playing havoc with work and school days, we are overdue for some fun. This has nothing to do with libraries, but it puts a smile on my face and that is all I am trying to do. So enjoy. 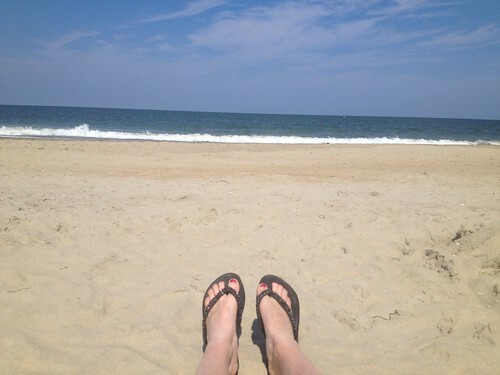 I do not plan to post next week because I will be spending time with the family and because I assume most of you will be doing the same and won’t be thinking of reading a blog about medical library stuff. So I wanted to wish everyone a Happy Holidays and New Year. I will leave you with this fun little library holiday cartoon. Santa just might be a librarian. Dude already has some mad indexing and database skills if he has been able to maintain a list of the world’s naughty and nice children. I want to thank Melissa Rethlefsen for finding this gem and sharing it on Twitter. It is perfect to share as a Friday Fun. If you think Part 2 is a thriller, make sure you watch Part 2 and Part 3! The campy music and high detail graphics makes me think of it as the School House Rock version of how to do database and citation searching. The SCC/MLA meeting had a costume party and I thought I would share my costume. Anybody else who wants to share their pictures from the night, post the link in the comments. Hope you had a Happy Halloween! 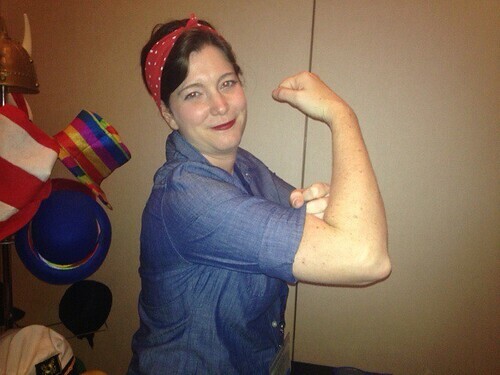 Medical Librarians: We Can Do It! Friday Fun: Taubman Library Blues Brothers? I spent this last week getting caught up from my vacation. I thought I would start off with a Friday Fun post to get me back into the blogging world after a very stressful week of trying not to turn into a lobster. The twitterverse alerted me to this little video featuring our illustrious Past President of MLA, Jane Blumenthal. I thought it was a creative way of telling people about Taubman Health Sciences Library moving the older books and journals to the Health Sciences Remote Storage Facility. While the car that Jane and Paul use was certainly cool, nothing can eclipse the original Bluesmobile. The outtakes are just as fun to watch as the polished video. Well done. Posted on August 9, 2013 August 8, 2013 Author KraftyLibrarianCategories Friday FunLeave a comment on Friday Fun: Taubman Library Blues Brothers? A co-worker forwarded me this video the Seattle Public Library did to kick off their 2013 Summer Reading Program by setting a new world record for the longest book domino chain. According to the video 27 volunteers set up 2131 books and ate 112 slices of pizza to help make the world record. My only question (I fully realize this sounds like a grouchy librarian) is how long did it take to clean up and reshelve all of those books. Last Friday Fun I briefly mentioned the unofficial Drinking SIG of MLA, this Friday Heather Holmes also known as @LaMedBoheme73 on Twitter and #DrinkingSIG Convener, wrote a more in depth guest post that I thought would be fun to share. *BTW as Heather mentions you don’t have to drink alcohol. I’m living proof, because I remember being pregnant one year sipping away at my Coke. What is the (unofficial and not at all sanctioned by) MLA, #DrinkingSIG? 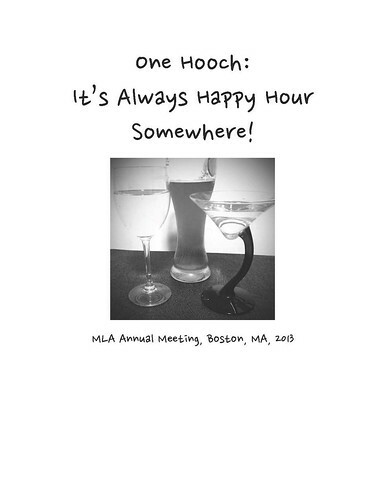 The MLA #DrinkingSIG came about a few years ago prior to the MLA annual meeting in Minneapolis. There was twitter banter about social activities to take place after the day’s events were over and the #DrinkingSIG was born. Key players in the (very) early discussions were myself, @krafty, @deanhendrix, @eagledawg and @gabinator, and from there many others joined in. Since then it has become something that many of us formally add to our schedules as something to do while at MLA. To be clear, just because we call it the #DrinkingSIG, we do not exclude anyone. You do not have to consume alcohol of any sort. We assume that even if you don’t booze it up drink alcohol, you probably drink water, tea, Pepsi, or something. See what I did there? Just by ‘drinking’ you qualify for #DrinkingSIG membership. Our intention is to get together with old friends and hopefully make some new ones, too. It is a chance to unwind after long and sometimes stressful days, and to network with your colleagues while rehydrating* your body. Last year (2012) was the first year we made it a little more formal when I introduced the idea of opening a CafePress shop to sell #DrinkingSIG merchandise and have the profits go to the MLA Scholarship Fund. The shop offered tshirts and umm, obviously, drinkware like pint glasses and shot glasses. This year’s shop includes some more drink related products like can cozies, a cocktail shaker, and of course a flask. There’s also a small flask on a necklace. It is only 1oz, but as @eagledawg said on my Facebook page: “Flask. Necklace. 1oz isn’t enough, you say? Remember those consecutive 7am committee and business meetings you have to go to? ‘Cream’ for your coffee = Bailey’s. ‘Nuff said. ” The logo on this year’s products says One Hooch: It’s Always Happy Hour Somewhere! MLA Annual Meeting, Boston, MA, 2013 accompanied by a picture of a few of my own personal drinking vessels (copyright issues avoided). The theme was a combination of submissions by Molly Knapp and Heather Brown. Special thanks to them. The only problem with CafePress is that they don’t issue payment of profits to you until you reach a certain amount. To keep things reasonable (read: most librarians are poor) I haven’t added a huge markup up the products so I have yet to make a donation to MLA on behalf of the #DrinkingSIG, but hopefully we’ll make enough this year that I can do so. I’d like our first donation to be at least $50. Right now I have about $22. This year’s meeting does not have a Tweetup scheduled so we will make one with an official (but not sanctioned by MLA!) #DrinkingSIG meetup. Probably a good time to have it would be during @TheBeardedPigs event on Sunday night. The EBSCO party is also that night, but The Pigs usually play relatively late and the EBSCO event is within walking distance so people who want to do both won’t be stuck waiting for a bus to bring them back. Another possibility could be on Tuesday after Tech Trends. The Taste of Boston party is also that night, but for those of us who couldn’t shell out the extra $ to go to it, can have a #DrinkingSIG event somewhere. Plus, I’m a panelist on this year’s Tech Trends and I’ll definitely need a drink afterward. Also, it can be considered a #DrinkingSIG event any time that 2 or more MLA members are drinking together. They can happen any time, any where! Go to the CafePress shop, get some gear so we can make some profit, and we’ll see you at MLA in Boston! *some drinks rehydrate better than others. All members are encouraged to drink plenty of water before, during, and after #DrinkingSIG events. Many who go to MLA often find themselves in the evening after the meeting going out to dinner and the bars to discuss library and non-library stuff. I remember somebody mentioning that we met for drinks so often that we could have our buisness meetings at the bar. After a good laugh and a few more drinks later the unofficial Drinking SIG was born. I want to stress it is all in good fun and completely unofficial from MLA. There are no dues but you will probably have a bar bill. Last year was the first year the unofficial Drinking SIG came off of the barstool and started selling t-shirts and other fun items promoting the group. This year for 2013 a new design and new set of items is available http://www.cafepress.com/drinkingsig for you to purchase. Even though the SIG is not official, it wouldn’t exist without the people of who attend MLA. So all of the profits from the SIG’s cafepress site sold will go to the MLA scholarship fund. Next Friday Fun post will be a guest post from Heather Holmes about the unofficial Drinking SIG. I am cheating a bit. Today is Thursday but I am posting a Friday Fun post. The reason is because this upcoming Friday is the Friday before Christmas and many people may be taking it off for a longer holiday weekend. I wanted to take the opportunity to wish my dear friend and colleague Jodith Janes congratulations and best wishes on her retirement. 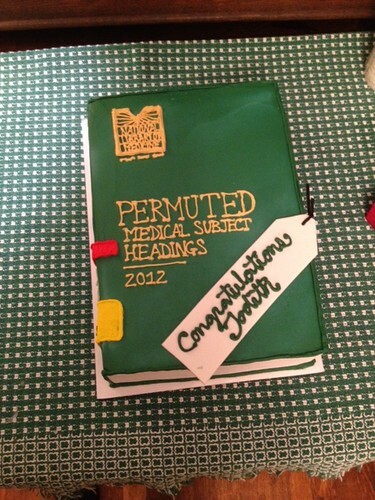 I was fortunate to have started my medical librarian career at the Cleveland Clinic and I consider Jodith my mentor in all things referencey. It was an honor and a priviledge to learn and work with her. I know she is looking forward to not dealing with the snow and rush hour this winter. Jodith, I hope you will enjoy your time with your family, gardening, and volunteering at the Natural History museum. We will miss you very much. It won’t be the same without you. 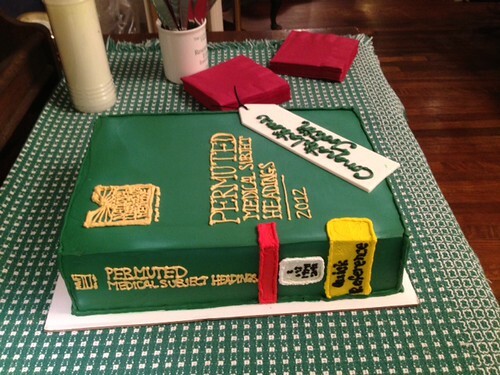 Thank you Emily at Wildflour bakery for making on of the best medical librarian themed retirement cakes ever! She even got the spine lables!